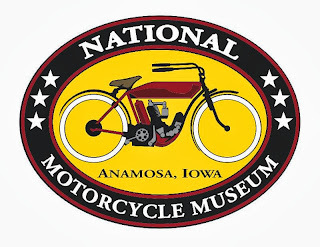 In an average week, the National Motorcycle Museum gets 5 to 10 calls and emails from enthusiasts of old motorcycles looking for parts sources, values and photo identification. We do our best to steer people to good information and parts sources, and one is, "Make sure you attend Davenport." Each Labor Day weekend the Chief Blackhawk Motorcycle Club, based in eastern Iowa, hosts what is probably America's largest swap meet for true antique motorcycles, 35 years of age and older. There you will find everything from rare parts to seminars on restorations. You might even bump into Mike and Frank, celebrity American Pickers. Even better, Friday night is always Vintage Flat Track racing, right there at the Mississippi Valley Fairgrounds, home to the event. The National Motorcycle Museum has set up at the swap meet there for years. It's the place we need to be to stay in touch with our supporters and folks that need to know the Museum is "just down the road about 75 miles, in Anamosa, Iowa." Here are a few photos from the meet. Of course Harley parts to help you restore your Pan or Knucklehead are popular offerings, but I have heard of restorers locating great parts for Parillas, BSA's, Nortons and even Bultaco and CZ motocrossers. The other good thing about Davenport; on that Friday and Saturday there is likely no place on the planet with more information on old motorcycles. If they are not in the middle of a trade or transaction, vendors are usually more than happy to help you with a parts question, a resource for accurate paint colors or give you their opinion on a source for reproduction parts that look right and fit. Plan on attending the Davenport Swap Meet in 2014, August 28, 29 and 30. Davenport is antique motorcycling at its finest. And after you donate for parking, admission is FREE!